Second row, center: Dr. Steven Diasio (white shirt) and Emily Gorman (denim jacket) during one of the two Strategic Management classes. Photo credit: Emily Gorman. 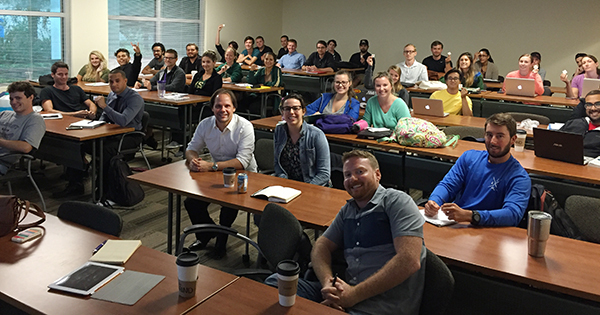 Eighty students in the Kate Tiedemann College of Business at USF St. Petersburg are collaborating with the Suncoast Sierra Club and its 100% St. Pete campaign, a local extension of the national Ready for 100 campaign. The initiative aims to power the City of St. Petersburg with 100 percent renewable energy by raising public awareness of renewable energy and the energy industry, and by developing pilot programs with partner organizations. Undergraduate students enrolled in two sections of the Strategic Management capstone course were divided into 14 teams. Under the guidance of Dr. Steve Diasio, professor of Innovation and Management, the students work together and use the strategic thinking skills and the tools learned in the class to develop tactics to get citizens interested and involved in climate action planning and renewable energy. Students use the City of St. Petersburg as a case study, learning about everything from biofuels and solar energy systems to climate change mitigation planning, resiliency and vulnerability assessment. “This is an exciting project that not only helps the community but also enables students to develop strategic and innovative thinking skills that will prepare them for jobs in the industry,” said Diasio, who incorporates real-world client projects into many of his courses. Previous projects have included work with Valpak and The Moorings. To get his students involved in the campaign initiative, Diasio contacted graduate student Emily Gorman, an MBA student who works as a sustainability consultant for INSPYROD. The firm was hired by the Suncoast Sierra Club to run the 100% St. Pete Campaign. Gorman works as a campaign co-manager with James Scott, another Inspyrod consultant and USFSP Florida Studies graduate student. Representatives from the Suncoast Sierra Club have attended every class session, providing real-time feedback as the students meet project milestones. Gorman said this type of collaboration is largely unprecedented for the Suncoast Sierra Club, which has had a lot of USFSP interns but never previously collaborated with a professor to create this type of classroom experience. The Suncoast Sierra Club will host the 100% Celebration on Friday, Dec. 9 from 7 p.m. to 11 p.m. at Station House in St. Petersburg. The event will feature Mayor Kriseman, members of City Council and will recognize the achievements of the city government officials, USFSP and other partners for their sustainability efforts. USFSP Sustainability Planner Brian Pullen has been working across departments and with students to author a Climate Action Plan (CAP). This plan will serve as a guide for how the university will reach its goal of carbon neutrality. Later this fall, USFSP will join with the Sierra Club and the City for an event on campus. On Oct. 29 from 10 a.m. to 1 p.m., the Suncoast Sierra Club and their partners will participate in the 100% St. Pete Solar Tour, a tour of St. Petersburg businesses and homes that will include USFSP, LumaStream, and the home of City Council Member Karl Nurse. It helps to expose the campus to larger numbers of people and highlight USFSP’s unique net-zero parking garage. The U.S. Green Building Council will host the seventh annual LEEDership Awards at USFSP on Nov. 9 at the University Student Center, a LEED Gold Certified building. St. Petersburg Mayor Rick Kriseman will serve as the keynote speaker.